As the Fourth of July approaches, now is a great time to reflect on the qualities that make our state and country great. Education is certainly one of them. And in fact, education is enshrined as a core, foundational principle in Arizona’s constitution. The framers of our state constitution knew that education would make Arizona strong, and so they required that, from kindergarten to college, it would always be available. Yet Arizona’s public schools have struggled with underfunding for decades. This year, voters narrowly passed Prop. 123 as the best available option for supporting our school districts. But they did so because Gov. Ducey promised that it was only the first step in restoring public education funding and that other steps would soon follow. More than a month after that election, though, Gov. Ducey has made no indication he plans to follow through. 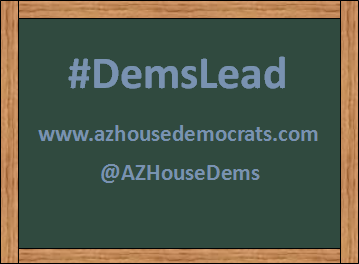 House Democrats, on the other hand, are working tirelessly with the AZ Schools Now Coalition to enact meaningful next steps. We know that Arizonans overwhelmingly prioritize public education funding, and that is why Democrats have always been the champions of this issue. Arizona’s constitution demands that the legislature appropriately fund public education. Arizonans demand that the legislature appropriately fund public education. And sadly, public K-12 schools are not the only ones left out in the cold by Legislative Republicans. Our constitution also says that higher education should be “as nearly free as possible.” But tuition costs at Arizona’s universities have been rising for years and have been above the national average for public universities for the last several years. This year, House Democrats proposed a simple measure to give Arizona’s public universities an extra $50 million to help lower tuition. Legislative Republicans rejected that plan in favor of funding for Koch Brother propaganda programs and chose not to ease the economic burden our university students face. Their priorities do not respect our constitution’s demand for low-cost higher education; they undermine it. Gov. Ducey and Legislative Republicans have failed Arizona’s schools at every level. This Fourth of July, while we celebrate our freedom, our independence, and even our greatness, let’s remember how we got here. It’s time to really put education first.